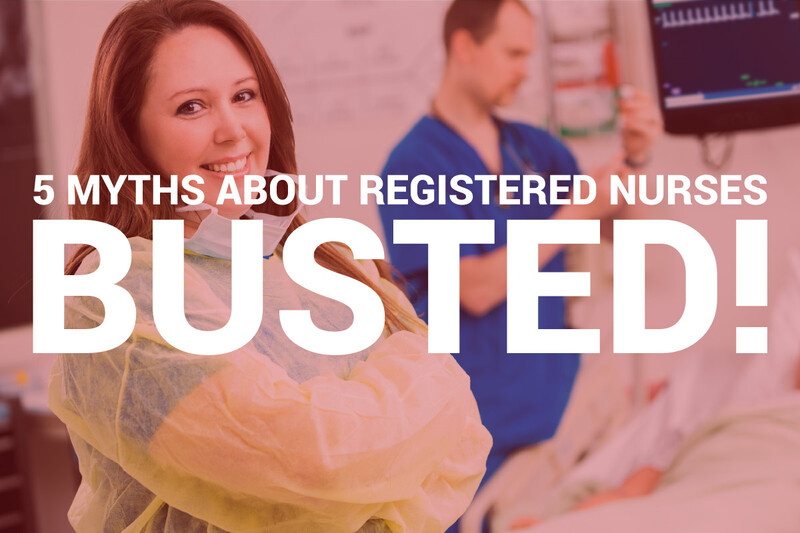 5 Myths about Registered Nurses – BUSTED! Despite many nurses’ attempts to squash common stereotypes about the nursing profession, a number of myths continue to linger. Here are 5 of the most common myths about Registered Nurses – Busted! 1. Nurses are like a doctor’s assistant. Busted! Healthcare is a team-oriented industry. While nurses may certainly lend physicians a hand from time-to-time, the majority of a nurse’s time is spent working independently taking care of patients. It’s a common myth that physicians are the nurses boss. Nurses typically answer to other nurses who are higher up in leadership positions. 2. If I get my RN, I’m stuck doing the same job forever. Busted! With over 100 specialties and numerous advanced degree options, nurses have the ability to create their own career path and change their jobs quite often. Nurses can obtain certifications to move to different specialties or earn advanced degrees to move up into leadership positions. AmeriTech College offers a fully online Bachelor’s Degree in Nursing completion program for nurses wanting to move into leadership positions. A number of outstanding masters and PhD programs available for nurses as well. 3. Nursing is a woman’s job. Busted! We can’t bust this myth enough! What draws people to the nursing profession is the desire to interact with people and impact patients’ lives on a daily basis. This aspiration is not unique to women; it’s universal. Over 6% of nurses are men – and this number is on the rise! Men have always played a critical role in the nursing profession, dating back to the first nursing school in 250 BC. 4. I won’t make any money as a nurse. Busted! Recent nursing grads earn some of the highest starting salaries compared to recent graduates in other industries (they’re worth every penny…and then some)! Obtaining additional certifications and advanced degrees enables a nurse to earn more and more throughout their career. 5. Being a nurse is easy. Anyone can do it. Busted! Being a nurse is more than just putting on scrubs and showing up for work. Read our recent blog, 5 Signs You Have the Makings of a Great Nurse. We often say to our prospective students, the skills of a nurse can be taught – the heart cannot. To be a nurse, you have to be tough, have excellent attention to detail, be a great communicator, an outstanding problem-solver, have a sense of humor, and most importantly, have the ability to demonstrate compassion and empathy for patients on a consistent basis. Would you like to add to this list? Hop over to our facebook page and leave a comment. You can also jump on twitter and post using the hashtag #NurseMyths. We’d love to hear them! If you’re looking to be a part of this amazing profession, Ameritech College of Healthcare is home to the largest private nursing school in Utah. Click the button below to have someone from our team reach out to you!